Up until now I have avoided the trend of adults reading young adult fiction. I have never read a single Harry Potter book, but I have seen a few of the movies, and I have avoided Twilight as much as possible. (Of course it is nearly impossible to completely avoid such mega-media events, I find myself picking up references to these things, to “Team Edward and “Team Jacob” by sheer cultural osmosis.) This avoidance of young adult fiction came to an end with The Hunger Games. I picked up the first book out of curiosity, having heard a few of the details through osmosis, and found myself tearing through all three fairly quickly, they were this summer’s beach reads (concealed by the blank slate of a kindle). For those unfamiliar with the plot, The Hunger Games is basically a variant on the dystopian death match genre, the idea that in some future society, post-apocalyptic or not, human society will end up staging some kind of life of death contest. Sometimes these games are for entertainment (Death Race 2000, Running Man) usually on a variant of bread and circuses, in which entertainment explicitly functions as a form of control, and other times they function as a form of punishment (Battle Royale) or justice (Mad Max Beyond Thunderdome). They thus represent either barbarism or the spectacle, they are all variants on “bread and circuses” of decadence and decay. In this case The Hunger Games, take place in the not too distant future, in a country called Panem, a country formed after ecological and/or political cataclysms destroyed the US. (The name panem is derived from the Latin phrase “panem et circenses,” bread and circuses) Little is said about this cataclysm, nor is much given that would connect this world, the world of the books, to the world we know, there is little mention of recognizable culture or politics, not even a crumbling Statue of Liberty. Rather, the book’s founding historical narrative begins with the thirteen districts of Panem revolted against the Capitol. The revolution was put down, apparently destroying one of the districts, and the Hunger Games exist as a kind of memorial and punishment. Every year two children, age twelve to eighteen, from each district are selected through a kind of lottery (perhaps a nod to Shirley Jackson) to participate in these “games” in which they battle to death. The specific details of the game, especially its setting and environmental conditions, vary from year to year. The games can take place in any environment, from wooded forest to ocean islands, and every creature and obstacle, from poisonous wasps to killer monkeys, is designed by the game creator. What remains constant is that there are children, weapons, and at the end one child is still standing, and is rewarded for the victory. The districts where the children come from are by and large impoverished, and are each defined by a central industry. District 12 (the home of the protagonist, Katniss Everdeen ) is dedicated to mining, and is generally modeled after Appalachia, complete with a long tradition of game hunting to supplement meager pay. The other districts are dedicated to agriculture, fishing, lumber, livestock, weapons production, and electronics, to name a few. This gives the novels a basic textbook understanding of the economy, like those maps of the US with icons representing wheat and industry placed over Nebraska and Michigan. The work of the different districts doesn’t just define their contribution to the economy, it defines their character, the skills, talents, abilities, and degree of subjection. The most exploited districts, those dedicated to agriculture are repressed, while those dedicated to weapons or technology are kept relatively affluent. It is class composition for young adult readers. The real class conflict is between the various districts and the Capitol. The Capitol is portrayed as the pinnacle of wealth and decadent consumption, while those in the districts struggle to survive the citizens of the Capitol indulge in fashions, dyeing their skin, and purchase the latest trends and devices. The relation of exploitation is actually more feudal bordering on the Asiatic mode of production, as the different districts pay tribute to Capitol. (Incidentally, “tribute” is the term used for the children who are forced to participate). What the novels miss in exploitation, however, the make clear in terms of difference. The novels underscore again and again that people who starve and people who dine on the latest extravagant delicacy make up part of the same world. The greatest innovation of the novels is what they bring to the basic format of the games. Battles to the death have been done again and again, with various machinery and weapons. What the Hunger Games brings to this is two things. First, generalized surveillance, the participants of the hunger games can be seen at any and all times, and are aware of this fact. This generalized surveillance relates to the second fact, one that makes this a post-reality TV novel. It is not enough that the participants kill each other, but in doing so they must provide a compelling persona and narrative. Doing so guarantees them good standing in their odds and means that they will be provided with assistance by those who are betting on their victory. Before they enter the arena they are given makeovers and are interviewed like contenders on American Idol. Gaining the support of the audience is a matter of life in death. 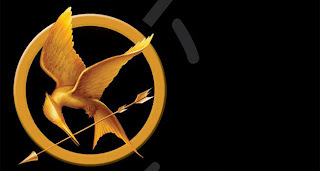 Katniss Everdeen, the heroine of the novels, is not selected by lottery, her sister is, and her offer to substitute her sister is her defining act of bravery and agency. (The second is important, since the novel’s central theme is “games,” not just the brutal contests to the death, but the games of politics and love, in which the distinction between playing and “being played” is never that clear). She is also reluctant to be made over, to put on make-up, and is much better at killing someone with a bow and arrow than wining an audience over with her charm. She is introduced as the quintessential tomboy, more interested in hunting and wearing her father’s hunting jacket than anything else. Her entry into the games is also a forced entry into gender norms, even a romance and picking out a wedding dress. As deals were made for the inevitable major motion picture, it was perhaps not surprising that two of the major contenders to play Katniss were Jennifer Lawrence, from Winter’s Bone, and Hailee Steinfeld, from True Grit. The three characters are all cut from the same cloth: they are all poor and rural, they all have dead fathers, fathers whose loss must be dealt with in some way, avenged or corrected, and they each ally themselves with an unreliable (and often drunken) father figure in order to do “a man’s job,” proving themselves to be more than any man in the end. All three offer an interesting pop-culture meditation on female adolescence, one that contrasts quite sharply with Tiqqun’s Theory of a Young Girl. For Tiqqun the young girl is the total and sovereign consumer, the ideal of all marketing, and advertising, regardless of gender. These three girls are opposed to such appearances in every sense, defined not so much by work than by duty. They all end up wearing their father's clothes at some point or another, a testament to utility over appearance as much as longing for a lost father. They are three little Antigones, tragic and in some sense always already mourned, none of these stories take place in the present. Katniss is an exception in that her story, unlike the others, has its romantic subplot, but it is not one that she initiates. Children are selected into the games in pairs of boys and girls, Katniss’ partner Peeta quickly declares his love for her. This idea of two star-crossed lovers forced to kill each other becomes precisely the convincing story, the spin that makes them media stars and helps them survive, but “is it real?” Much of the book’s emotional core comes from this last question, a question that is explicitly asked in the final book. This question is asked against the backdrop of Katniss’ feelings for Gale, her hunting friend from her life as a tomboy. Although I have yet to see “Team Peeta” and “Team Gale” T-shirts, it seems that a split of romantic loyalties is an essential ingredient to the young adult novel. The plot of the books are artfully contrived to hold this question off until the end. The plot of the books eventually descend into the cliché of rebels becoming oppressors (pigs becoming farmers and all that) which is perhaps one of the central myths of our “anti-promethean” times. However, their strength is in how they deal with the rule of appearances. Katniss is made over to participate in the games, and eventually becomes the symbol of rebellion. Her real struggle is between herself and her image. They are struggles with becoming an image as much as they are struggles with being made into a standard idea of femininity (thus not to far from Tiqqun). Katniss may be a hero of the post-apocalypse, but she is also a hero of an age in which individuals, men and women, are constantly made and remade into images of themselves. This is what makes the novels contemporary, well that, and fact that it wouldn’t hurt to become handy with a bow and arrow for the dark times ahead. Few quick thoughts on the film: Generally, the film is blandly faithful to the book. All of the major scenes are included. However, the shift of medium and the loss of Katniss' first person perspective forces the film to show more of how the games are seen rather than how they are lived. In place of Katniss' recollections about past games and the general idea of sponsors, we get to see the hosts explaining such things as the mutations and even some scenes of sponsors being wooed by Katniss and Peeta's mentor. The games are portrayed as more of sporting event than reality tv show, complete with running sideline commentary. The loss of the first person perspective deprives the film of some of its tension between appearance and reality, between Katniss pretending to be in love with Peeta and her actual confused feelings. It was perhaps one of the book's greatest strengths is that the games are never really seen, never really represented. We get Katniss wondering how her actions will be edited, screened, and viewed, but we never really see this. We are forced to identify with the anxiety that separates the individual from her image. Without the internal conflict to drive much of the narrative, the film is then forced to foreground the dimensions of the political allegory, including some of the elements that do not show up until the second and third books. President Snow is already introduced as character and we see more of his interactions with Seneca Crane, the game's designer. These interactions include the following scene, which tries to explain the function of the games as bread and circus, as spectacle to keep the masses in line. The mention of "hope" as a tool of control will draw inevitable comparisons to the Obama presidency and its various failures. It would be very easy to call this a post "Occupy"film, especially since all since all signs of wealth, class, and inequality have now been rebranded as post OWS moments. (As if all these things were completely unheard of before last September). I believe that even Tower Heist was called the first post OWS film. There is something a little awkward about a major movie, our bread and circus, illustrating a dystopian society's bread and circuses. I read that director declined to have the movie made in the ubiquitous 3-D that is constantly being sold, fearing that doing so would cross a kind of line from being about the "hunger games" to being a kind of hunger game. A better film would have turned this tension into something a little more interesting, but more interesting would have been less of a blockbuster. The film does get in one good line about identifying with the underdogs, a universal theme of much literature and films, and the actual underdogs, the exploited and oppressed, who are kept in line by rooting for the underdogs. While the novels are written from the perspective of Katniss, a player of the games who refuses to be a victim, the film is framed from a more ambiguous viewpoint, which is why the film focuses on the moments of sympathy of the audience and game makers. Oh and by the way, and Team Peeta and Team Gale T-shirts? They exist. I also heard, through osmosis, that this series was amazing. Looking forward to checking it out. Glad to read your post on this. My daughter loved it so I was already planning to read it myself. You have given me added incentive. I liked your review very much. I invite you to read mine which is a different reading. I just reread this and was even more impressed this time.